Glencoe is famous for its mountains but there’s plenty of water too! The River Etive is a favourite with more experienced paddlers and The River Coe also draws increasing numbers of boats too. However, a paddle in a kayak on Loch Leven in the summer sun tends to have a wider appeal. Highly recommended is a taster session with Action Glen based locally on the shores of Loch Leven. A variety of activities are available including sea kayaks, sit-on-top kayaks and SUP (stand up paddling) boards. All equipment is provided along with close supervision by qualified instructors. No previous experience is necessary. Half, full and multi-day courses are available. Based in nearby Ballachulish, it’s an ideal opportunity to get out onto Loch Leven. Whether you’re looking to develop your own sea kayaking skills in preparation for longer trips or are looking for an all-inclusive family activity, Action Glen is the place to look. If you like dressing up in rubber then Onich based Vertical Descents might appeal. Exhilarating water based activities including Canyoning, Coasteering, White Water Rafting, River Bugging and Fun Yakking. All equipment is provided, along with professional guides, and activities are based at a variety of locations, both within the local area and also slightly further afield. Equally popular with both family groups and Stag Parties, Vertical Descents offer a great opportunity to try some of these up and coming activities. Canyoning at nearby Inchree is the highlight of any trip to the area! Descending the series of waterfalls by a variety of method, including both sliding and jumping into the deep pools below is tremendous fun, and the prospect of jumping ‘the big one’ will make even the bravest think twice before taking the leap. And if you’ve never zip-wired over a waterfall using the pool below as a brake, then now’s your chance! If you want to try your hand at some white water kayaking or would like to improve your skills give Snowgoose Mountain Centre a call. Other activities include Sailing, Sea Kayaking and Open Canoe trips as well if you are looking for a more relaxing time on the water. Fancy trying some white water funyaking or white water rafting. Active Highs run trips for everyone including kids aged 7+. If white water rafting doesnt appeal they also do river rafting safari’s for those of you looking for a calm trip down the river to take in some of our wonderful scenery. 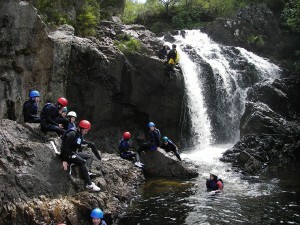 Some of their other activities include Canyoning, Gorge Walking, Canoe and Kayaking Trips. For more information about sailing on Loch Leven plus the opportunity of participating in races or the community sailing programme try Glencoe Boat Club. The annual Glencoe Regatta takes place in June each year and brings a sailing spectacle to the shores of Loch Leven at Tighphuirt. If you would like to learn how to sail or polish up on some more techincal techniques Snowgoose Mountain Centre do one day courses for beginners on their 16′ dingys which can take up to four people or for the more experienced sailor they have 21′ dingys available. If you are a more experienced sailor you can also rent their dingys for the day. Open Water or Outdoor Swimming has seen a huge surge in interest in recent times. With rivers, lochs and sea lochs, the Glencoe and Loch Leven area is a great location for those hardy enough to take to the water. See more about Outdoor Swimming and the Glencoe Open Water Swim on our Swim page.